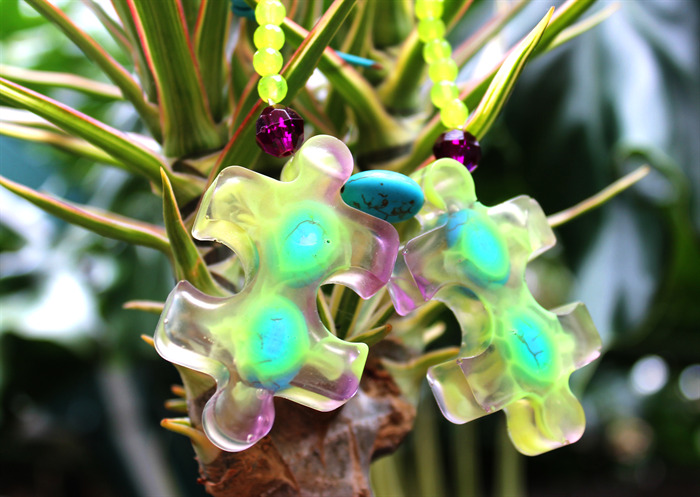 It's almost an etherial mix of colour in these puzzles, with yellow and purple swirling softly around the embedded turquoise stones, giving the illusion of moving water. This is a very easy to wear piece, perfect for those of you not quite confident enough (yet!) to pull off some of our more outlandish pieces (wait, aren't they all outlandish?) It's like a gateway piece- one wear and you'll be hooked. The piece hangs long at and adjustable 40cm and it fixed with one of our cute-as-a buttons. There is a sister version of this piece with turquoise stones (not yet listed) email us if your preference is more blues- or you want the set.